No self-respecting site about “Italian food, wine and culture” can get away without posting the occasional recipe so here’s my first. But first a little back-story, because every recipe has a back-story and once you know it you can enjoy the dish that much more. Remember the Soup Nazi on Seinfeld? People went there because even though the guy was, well, a bit of a Nazi, the soup couldn’t be beat. I have seen a similar situation down in Puglia where I know a guy (not a Nazi) who tends to olive trees. The trees need somebody who fixes them up every once in a while including cutting away the dead parts of the trunk so the healthy part can survive. This is a delicate job because cut too much of the trunk and the tree can die, don’t cut enough and you might miss the sick part, which will soon spread and destroy the tree. This olive tree guy is actually not very good at tending the trees and to boot he’s more expensive than his competitors, but he has many clients because if you have given him work in a particular year he’ll give you a few jars of his incredible chili pepper preserves come Christmas time. 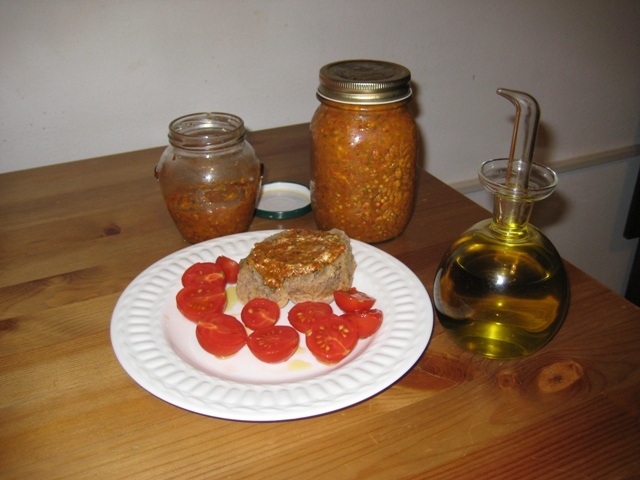 The preserves can be spread on bread or used to give any dish, including pasta, a kick. Every once in a while a jar of this chili pepper preserves filters down to me (I know people), but it’s never enough so I took action. 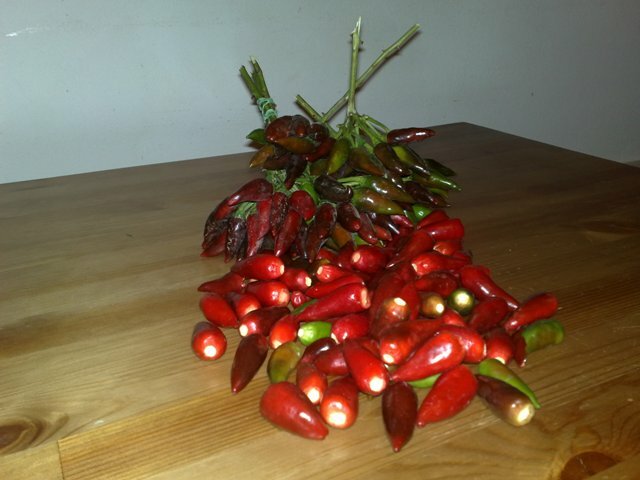 I haven’t managed to get olive tree guy’s recipe, but I did speak with several people in southern Puglia who have been making their own chili pepper preserves for years. Piecing together what these people told me and tinkering a bit I have come up with my own recipe that produces a spread not that far from that of the olive tree guy (and you don’t have to hire me to do something I don’t do well). 1) Take the stems off the chili peppers, put them in a bowl, add 1-2 spoons of salt, cover them with wine vinegar, and leave for about 24 hours. 2) Lightly squeeze the peppers to get rid of any excess vinegar and then put them in a pasta strainer for several hours so a bit more vinegar can drip away. 3) Cut each pepper into two or three little pieces, add the olive oil, garlic, mint and capers and then blend until you have a smooth spread. (As an alternative, you can avoid the blending and instead cut the peppers, garlic and mint into small pieces; then add the capers and the oil. I much prefer the blended version). That’s it, you’re done. You’ll need two medium jars for the preserves, which must be kept in the fridge. Boil the jars and their tops for about 15 minutes before using them so as to kill potential botulism microbes. As a further precaution, it is a good idea to make sure the chili pepper spread is always completely covered in oil so you will have to top up every once in a while.